Covered call writers and put-sellers must set goals regarding targeted premium returns before entering trades. These objectives are based on personal risk tolerance, market assessment and chart technicals. One of the most flagrant mistakes made by option sellers is to make trade decisions based on the highest premium returns. Covered call writing and put-selling are conservative option strategies geared to conservative investors who have capital preservation as a key strategy goal. This article will highlight a trade initiated by a member of an investment club who asked me to analyze the trade. An in-the-money strike was selected indicating a defensive posture in the trade where the intrinsic value component will protect the time value component. This will generate additional downside protection but not allow for additional share appreciation potential profit. The $35.00 strike has adequate open interest (545 contracts) and a spread of $7.40 – 10.90. A “negotiated price” of $9.10 was accepted. An initial time value return of 14.6% with a downside protection (of that initial profit) of 10.3% is huge and seems too good to be true on the surface. In fact, it is too good to be true. Whenever there is enormous premium returns we know that it is because the underlying security is extremely volatile. High implied volatility translates into high risk as share value can decline below the breakeven, $29.90 in this scenario. The implied volatility calculated for this $35.00 in-the-money call option is a staggering 187.43%, more than 20 times that of the S&P 500 on 6/23/2017. This is the reason for the great returns but hidden in the weeds lies the immense risk preparing to rear its ugly head. The amount of profit we stand to generate from investment vehicles is directly related to the degree of risk we are willing to assume. We should never be enticed by high premium returns until we have analyzed the amount of risk we are about to incur and make an assessment if it meets our personal risk tolerance profile. BCI: My portfolio makeup reflects a neutral bias, selling an equal number of out-of-the-money and in-the-money calls. Waiting to see how the vote on the new tax plan plays out before taking a more bullish stance. Outside of this concern the global economy is performing well. The 6-month charts point to a neutral outlook. In the past six months, the S&P 500 was up 9% while the VIX (11.43) moved up by 9%. Usually an FDA-related situation I’ve found with the biotechs when you see high premium – that’s why I avoid the whole sector myself. To follow up your question from last thread I do not think I am Karnac who can get the direction right consistently :)! I have no idea how long it will last! But I have been long a while now selling a few OTM CC’s and CSP’s for yield but letting most things just work. My portfolio turnover is low except for my speculative options buys/sells/spreads, etc., all small trades. I’ts been nice to see your ITM approach on individual stock CC’s work well, Justin.! One f the interesting things I find in this Community is we all do it a bit differently. I doubt one sock will ever fit all at BCI :). No probs, I was just talking about your statement saying that if you don’t get the direction right, you’ll lose. Just wondering how strongly you believe that? Like I said, my system of selling ITM cc’s doesn’t even try to pick the market direction (since I believe nobody can do that consistently). If my average position goes up, sideways or down (no more than a few percent), I win. Big falls should (hopefully) be rare enough to be more than made up for by all the winning months. Time as always will tell though. Thanks Justin, seems we are saying similar thngs: if you are holding long positions the real risk is the position whether you choose ITM, ATM, OTM or not write at all. In recent times I have been more concerned about capping upside than protecting downside so I have over written sparingly. I have bought dips either with CSP sales OTM on down days or with straight buys, see how they do for a while then look at some CC’s. 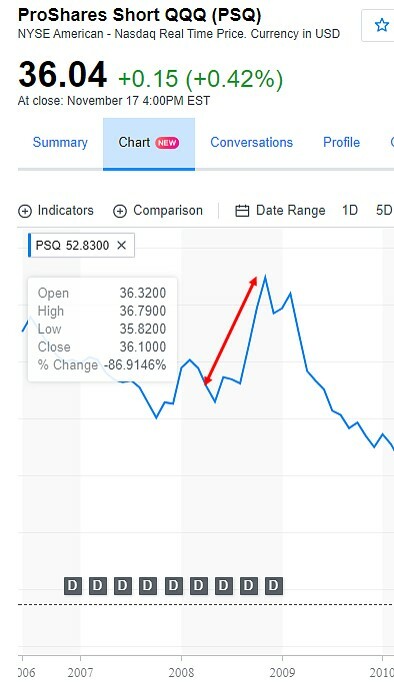 I don’t think PTLA is a good example of a too good to be true situation because several days later they got approval for a new drug and the stock soared nearly 20 points. But it is an example of high risk, high reward and FDA related situation like this tend to be purely binary. It’s in for a nice penny or a bad pounding when the verdict comes in. If one someone somehow had the stock on their radar and was willing to own it come h*ll or high water at a better price, you could make the case for selling a deep OTM cash secured put but that’s stretching things a bit. In general, situations like this should be left to volatility players as well as outright gamblers. Maybe insider traders as well (g). Yes I see what Alan is saying so a stock that FELL twenty points might have worked better as a cautionary tale. Presumably lots of studies have been done to death of using various option strategies in FDA-type situations so I’ll leave them to the experts. 11/02/16: “Cempra Inc’s experimental drug to treat community-acquired pneumonia, the kind recently suffered by presidential candidate Hillary Clinton, causes a potentially concerning rise in liver enzymes, according to a preliminary review by the U.S. Food and Drug Administration. The review, posted on the FDA’s website on Wednesday, comes two days ahead of a meeting of outside experts who will discuss the drug, solithromycin, and recommend whether or not it should be approved. The FDA is not obliged to follow its advisory panel’s advice but typically does so. Sometimes, more exotic option strategies can capture a move like this but they’re a bit complex and are not a sure thing. In general, it’s best to just be a rubbernecker at the scene of such a crash. I’ve been using Alan’s;guideline of looking for initial 2-4% time value returns and it has generally kept me out of trouble. Certainly a bull market makes life easier for all of us and compensates for some errors we all may make. However, mastering the 3 required skills (stock selection, option selection and position management) will allow us to succeed in most market conditions. It’s all about the education and that’s the value of all of us being here as we learn, respect and benefit from each other. Thanks to you, Marsha and our other participants for enhancing this learning process. Yes, a bull market makes life easier for all of us. And mastering stock selection, option selection and position management will allow investors/traders to succeed in most market conditions. AFAIC, position management in a bear market is a maybe. I don’t know how many here lived through any of the 1987, 2000 and 2008 bear markets when CC writers were hit hard. IMO, very few people achieve the ability to rigidly adhere to a disciplined exit strategy. Once under water, most people acquire breakevenitis and ride their positions even lower. Hesitate and if not already married to a losing position, you’re accumulating larger losses and you become the deer in the headlights, unwilling to take large losses. It’s human nature. If that occurs, the only premium available will be from selling covered calls which will most likely lock in a loss and doesn’t come close to covering additional losses. It’s not pretty and few are willing to do that. They become buy & hopers and 18 months is a long time to wait (the bear’s length in 2000 and 2008). I’d suggest that readers approach getting a feel for this in two ways. First, imagine that you had been writing covered puts over the past 8 years since market low March of 2009. That means shorting the stock and selling a short put (the mirror image of selling covered calls). Does anyone think that would have succeeded over the past 8 years? If mirror image thinking is hard to comprehend, obtain some stock data from 2008 and see how quality stocks performed. The highly acclaimed Dividend Aristocrat stocks lost on average nearly 25% at some point during that year. Even more by the March ’09 low. I’m curious. How did you fare in 2000 and 2008 with your covered call writing? Were you able to generate a positive return or did you accrue losses? Or did you sit it out after some point in time? Retail investors should know that by mastering the 3 required skills, we have control in all market conditions. This will ensure that we have the ability to mitigate losses and enhance gains. Through education, we will develop the skill set to take advantage of exit strategy opportunities when they present themselves. For example, if the Dividend Aristocrat stocks do not pass our screens, they will not appear in our portfolios regardless of reputation. I have been pleasantly surprised over the years how many of our BCI members have developed the structure to stand by a system (mine or one they developed themselves) that incorporates these skills. I beat the market in both 2000 (up a few percentage points) and (lost 15%) in 2008 (published multiple times on this site). In 2000, none of the dotcom stocks passed the BCI fundamental screens so they didn’t have a place in my portfolios. This confirmed the importance of the first required skill…stock selection. In 2008, when Wall Street monetized bad real estate mortgage debt, we had a aberration wherein both stock and real estate markets crashed. I admit that I didn’t recognize the depth of the recession and didn’t turn to cash until 9/08. I was back in the game in 3/09. If I could have a redo (I can’t), I would turn to inverse exchange-traded funds like PSQ (inverse QQQ). See the screenshot below on its 2008 performance. Retail investors should know and understand that we do have significant control in all market conditions to mitigate losses and enhance gains. Action beats inaction every day of the week. I know that you already know this. For our new beginning members, I can’t re-iterate enough: NEVER RISK EVEN ONE PENNY OF OUR HARD-EARNED MONEY BEFORE MASTERING THE 3-REQUIRED SKILLS…STOCK SELECTION, OPTION SELECTION & POSITION MANAGEMENT. I wholeheartedly agree with you that retail investors can and should strive to master the 3 required skills. I’m not sure that full control is possible since Shift happens on all keyboards. Willingness to own some long negative delta should be the next layer and your suggestion of utilizing an inverse ETF such as PSQ is apropos. Alan, you mentioned that in 2008 “none of the dotcom stocks passed the BCI fundamental screens so they didn’t have a place in my portfolios.” Just curious as to which specific screen(s) they failed. They did not pass our fundamental screens, specifically earnings and sales growth. Most dotcom companies were not making money so PE ratios could not be calculated because “0” would be in the denominator (Price/0). 10 positins entered in first week of contract cycle. 6 coverd calls were assigned today. 2 ended worthless, but the underlying are still well above break even. 1 bought back early in the month at 10%, it is PANW and I must sell at loss on monday. ER confirmed after the bell. This is the sixth monthly report posted, and I am very satisfied because I have accumulated 13.4% gain on my total account value since. I hope I can continue this way in the next 6 months too. Today I am 55% in cash, and am waiting for Barry’s list to enter new trades next week. Anyhow I still eked out a gain of about 0.25% which was better than the Russell 2000, which lost six points over the contract period. So my gain for the last five months is now just over 10% vs the RUT’s 6.8%, which I’m fairly pleased with since I’m using a conservative approach (mostly selling ITM calls) to a conservative strategy (covered call writing). Still need a lot more data of course to get a good idea of the long-term expectation of the approach. 10% gain in 5 months is fantastic when compared to any other investment. yesterday I sold PANW @143.75, which reduced my loss in this trade to 2.2%. I see now, that PANW bounced to 153.00 after ER report last night, but I do not regret my decision. I will never bet on a 50/50 chance. My goal is consistent monthly income with low risk trades. This week’s Weekly Stock Screen And Watch List has been uploaded to The Blue Collar Investor Premium Member site and is available for download in the “Reports” section. Look for the report dated 11/17/17. The thought is selecting a stock to play for more than one month at a time, so that after one month expiration you can play the same stock again. Does anyone else review the list like this? The problem is, if I trade a monthly CC and I am successful, it means the stock went up. Now to play it again the risk is the old saying: “What goes up, must come down”. Maybe Alan, or the more experienced members have a good answer. There are many ways to use our screens of eligible securities. For me, I look for the best of the best that suits my portfolio requirements and not necessarily the ones I can also use in the following contract month. Focus on the present…like a laser! As the current contract month plays out, a decision can be made regarding our current holdings. If it turns out that a security must be “bumped” from our portfolio because of an earnings report in the following month, so be it. There are plenty of other choices. i’ve searched on internet for a long time for something can improve my knowledge about options until i’ve found your books and now i keep it like “my Bible”. So, thank you so much from Italy!! I would like to ask you a suggest regarding one mistake i made two months ago, if you will not answer to me, i can understand you! The problem is: i bought on stock at 15.60 and sell an ATM call. Everythings was fine but i didnt close my stock at the expiration of the contract and now the price fall at -3.5%. Can you suggest me something like a “reparing strategies” in order to go out from this operation? I think i have to sell and ITM Call, is it right? So great to have another international member join our BCI community…welcome. We have all experienced such situations. The first thing I evaluate is whether I could have better managed the trade as share price was declining. Were my exit strategy opportunities acted on? Could I have done a better job? If price decline was due to a significant corporate issue (stock news can be checked at http://www.finviz.com) then we must execute one of the most difficult trades for retail investors…sell at a loss and move on to s stronger candidate. Since share price has gone down, we ask ourselves: “Where is the remaining cash best placed…in the current stock or another”? Remember, stock price can decline even further. The Weekly Report for 11/17/17 has been revised and uploaded to the Premium Member site. There was a formatting problem with the “Large Print” section. No results were impacted. Please use the report dated 11/17/17-RevA. I’ve gone through your beginner videos, your blog posts pertaining to portfolio overwriting, and your calculator and other resources. I want to start paper trading soon and then moving to real trading. – I will be using TastyWorks for buy-writing as I will likely be selling only a single contract and the fees seem the lowest with this broker for this volume. I did not see this on your list of online discount brokers so I’m curious to know your thoughts on them. – How many contracts do you or other BCI members typically sell? Just to get an idea of what I may wish to build up to in the far future. – I’m planning on building a position in BRK.B to sell covered calls against as I believe in the long term success of this company. – One of the biggest mistakes option sellers do is STO and forget about it until expiration Friday but as you mentioned this should only take a few hours per month on a 1-month contract so when and how often should I be checking my option? 1.The feedback I have received regarding Tastyworks has been positive. I have not yet included it on our broker file because it is relatively new but so far, so good. 2. There is such a huge ranch of contracts traded in our BCI community from 2-3 per month (ETFs) to hundreds per month. For me, I hold 15 – 25 positions in my covered call accounts and sell 50 – 100 contracts per month (plus a few in my mother’s account). I spend about 3 – 5 hours per month on portfolio management There’s no right or wrong here. it will depend on the amount of cash dedicated to these accounts and investor comfort level to manage positions. 3. I check my positions daily but most trading will occur on or around expiration Friday and the first few days of the new contract. You are so right that this is not a 3 AM informational that suggests “set it and forget it! If you want to scale in and out of positions, IBKR is more cost effective. Five trades of 200 shares is the same $5 commission as one trade of 1,000 shares – no flat fee penalty for multiple trades. There are some data fees. I pay $4.50 per month but they may be are higher for small accounts that don’t generate $30 in commissions per month. The offset is that assignment and exercise are commission free and that savings far exceeds $4.50 per month. There are some other perks at IBKR but I doubt that they are of interest to a covered call seller. If you trade larger blocks shares, you might be better off at a fixed fee broker. Fidelity and Schwab charge $4.95 per trade. Ally also charges $4.95 per trade but reduces it to $3.95 if you make a minimum of 30 trades per quarter. E*Trade charges $6.95 per trade but reduces it to $4.95 if you make a minimum of 30 trades per quarter. You might also take a look at Merrill Edge which last I read, charges $6.95 per trade. However, if you maintain a combined balance $50,000 with them and parent company Bank of America, you get 30 free trades per month. $100,000 gets you up to 100 free trades per month. In both cases, you get some bank perks as well. These change occasionally so if any interest you, double check at their web sites. We feel ready to trade stocks for real now, and I am wondering why TEAM is on the Pink list…I Paper traded it last month and made $286, less fees. The chart looks great, and ER is in January. Great job paper-trading and glad to play a small role in your education process. The reason TEAM appeared in the pink section (“Passed Previous Weeks & Failed Current Week) is because both MACD and Slow Stochastics were below their “trigger levels”. Typically, a stock may move between passing and failing during the option month. As you have discovered, it is important that you watch your trades during the month. If your stock moves into the pink section, watch the stick to make sure that it continues meets your requirements. All of the stocks in the pink section are re-screened each week and they may move back and forth between the white and pink sections. If the stock fails for three consecutive weeks, it is removed from the report. ….on your article this AM. It is so easy to get lured into these high returns – from personal experience – ouch! 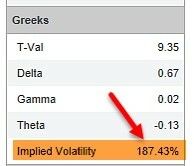 Is there a website to plug in a stock ticker and get implied volatility? I went on a search this AM and couldn’t find anything. Well, not exactly. I pulled up FINVIZ and they showed PTLA around 4% not 187.4%? I know we can tell by using our calculator however that is based on Return and doesn’t give IV. Decent online brokers provide IV info. If a stock based on fundamentals and especially the technical looks like it is on a tear upward, do you just buy the stock and sell calls once it looks like it is settling down a bit? Also, I have noticed some stocks where the MACD seems to be trending downward (between 20-80%) and volume seems to be neutal or low but the stock price is trending slightly upward. I don’t see how that makes sense. Regardless – is that a stock to avoid? If you dig into the calculation of Moving Averages as well as the MACD (Moving Average Convergence Divergence), you will see the answer. Describing it in words is far harder than a just looking at the numbers but I’ll try. The MACD is a 2nd derivative calculation. It’s composed of the difference b/t a 12 and 26 period EMA. Because of that, the indicator can move in the opposite direction as price. How can that be, you asked? The shorter moving average is more responsive to price change because the number of days included in the calculation is smaller. So when there’s a nice price move, it reacts faster and moves away from the longer term EMA (divergence) and in the direction of price. Now suppose after a sustained up move, price appreciation really slows down but still crawls up slowly (what you observed). The shorter yet faster EMA may continue to rise or even turn down slightly but the longer yet slower EMA begins to catch up as it is discarding the early days when there was no movement and now is weighting the recent up days more heavily. As the distance b/t the two averages narrows (convergence), the indicator turns down… and yet price is trending slightly upward. Let’s try another visualization. For ease of discussion and calculation, let’s pretend that the MACD is calculated with simple MAs. Suppose XYZ rises from $95 to $100 and the MACD rises to 80%. Now, suppose that going forward, XYZ trades at $100 indefinitely. After 12 days, the shorter SMA will reach $100 and stay at $100 as long as XYZ trades at $100. It takes the longer term SMA 26 days to reach $100 so the difference b/t the two will be shrinking (converging) and the indicator will begin heading down to zero (a false sell signal above zero). If one correctly used EMAs instead of these hypothetical SMAs, the number of days for each EMA to reach $100 would be longer but it would demonstrate the same. The short answer is that due to the math, a MACD turn up buy signal below zero may be true or false but must true above zero (and conversely for a sell signal). This is the phenomenom that you have noticed and that’s why you need a reference in the price domain to verify the signal’s validity. The MACD reversal is simply telling you that price appreciation has slowed down. Maybe it’s a pause to refresh. Maybe it’s the last gasp before price heads south. Time will tell. Sorry for the verbosity but a short string of numbers is worth a 1,000 words. I do not attempt to time my option sales on a bullish stock. I will, instead, craft my position by using a more bullish strike price (deeper out-of-the-money but still meeting my 1-month initial time value goals). Buying a stock and waiting also will result in time value erosion (Theta) of our premiums with no guarantees of share and premium appreciation. Your second comment describes a stock with mixed technicals. Here we do not necessarily avoid the security but may favor in-the-money strikes where intrinsic value serves as additional downside protection. This bulletin just in from the “Who Cares?” department: I will be away celebrating the US Thanksgiving Holiday with family until Sunday. Will chat with everyone next thread. In the mean time have a great trading week and a wonderful Thanksgiving! One thing I will be thankful for is this community. As for your warning, I’ve seen it too late. I am already 80% invested. It was no warning, just a thought that we are in a traditionally bullish time of year unless the politics of the day screws it up :)? I let things run this time of year through the “Santa Claus Rally”. I then sell calls after the New Year because January hang overs can be tough :). The market is impossible to time. Seasonality is helpful absent outside forces any given year. It is likely better to march on trading stocks and selling calls each month like you do. all my trades placed yesterday were selected from Barry’s list of bold tickers. I sold 12/15 NTM calls @ an average of 2.7% ROO, which is quite exceptional for my standards. I believe I made no mistakes so far, but I am ready for exit strategies if the market goes red. Everyone – Besides being a great article by Alan on IVolatility.com options calculator, what follows the article it is a great thread to read from Sept. 2015. Many practical comments on trading and views by members. What a treasure of information in the blogs. In summary, before buying a stock and selling a call option against that each time based on the BCI report, what other analysis, if any, do we need to do on the day of trading because, let’s say, for argument sake, that the prices of one or two selected stocks have moved significantly compared to the prices on the BCI report? All trades must be executed during hours when markets are open. The information in our weekly stock reports is generated after market close on Fridays. Almost all preparation can be accomplished over the weekend or in the evenings but we must re-check option chains when markets re-open. Return percentages will generally be similar but we must re-check. Use the multiple tab of the Ellman Calculator to make sure the initial time value returns, downside protection and upside potential meet our goals and trading style. I prefer to enter my trades between 11 AM and 3 PM ET to avoid early and late day market volatility. Exit strategies should be executed at the time these opportunities present themselves. We can also automate closing our short calls by setting buy-to-close limit orders immediately after entering our covered call trades based on our 20/10% guidelines. I became a member 6 months ago, and have been using the BCI weekly stock screen to select companies for my covered call portfolio. I have been averaging 2 to 3% monthly writing covered calls, which is fantastic! I have observed that my portfolio would have averaged 5 to 6% monthly if I had simply gone long and not sold covered calls. In a bull market such as we are currently experiencing, do you ever advise members to consider using the weekly stock screen to select long stock positions and perhaps refrain from selling covered calls? Thank you and the entire BCI team for your great service to average investors like me! Congratulations on your outstanding results. We do have many members who use our lists for buying and selling stock without the option selling. Most of these members have 2 separate accounts, one for covered call writing and one for buying and selling stock based on the weekly reports. In my view, covered call writing will out-perform in most market conditions but success can be generated from both approaches. 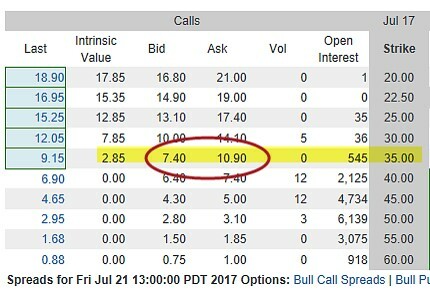 Is there any reason to not sell a covered call and a cash protected put on the same stock at the same time? Does this help to increase monthly profits? You can certainly write a call and sell a put on the same underlying. The same stocks are appropriate for both strategies. This is why our premium member lists can be applied to both strategies. Using both strategies on the same stock will not enhance our returns by using this combination of strategies. However, we can certainly be quite successful. In neutral to bull market environments, I prefer covered call writing where we can take advantage of writing out-of-the-money calls and have the opportunity to generate 2 income streams in the same month, with the same cash on the same stock…one from option premium and the other from share appreciation from current market value up to the strike. Put-selling generates only premium. We can always write an in-the-money put to generate additional premium but this will increase the odds of assignment and having to take possession of the stock. Put-selling may require a higher level of trading approval and may not be allowed in self-directed IRA accounts depending on the brokerage. Both are great strategies that offer significant opportunities to grow our wealth. It’s like choosing between an ice cream sunday and Boston cream pie. Covered calls and short puts of the same series (same strike and expiration) are synthetically equal which means that they yield similar results. So while selling a $55 put would generate only premium, that premium includes the potential gain that you would from stock appreciation if you sold the $55 covered call. So if IIVI is $52 and the $55 call offers 35 cents, the potential profit is $3.35 if assigned with a cost basis of $51.65. Assuming no pending dividend or a situation with hard to borrow high borrow cost, the $55 put should offer approximately the same $3.35 with the same cost basis of $51.65. The advantage with the put is that you have the potential for lower frictional costs. If above $55 at expiration, you’ll have incurred fewer B/A spreads and fewer commissions with the short put and that will bump up you ROI a bit. If IIVI is not over $55 at expiration, you end up buying the stock that you were going to buy in the first place, at the same net cost. Given that you mentioned two different strikes, the trade as you suggested is combining a bullish and a bearish positiin. Selling the $55 CC and the $45 CSP is the same as selling a $55 CC and a $45 CC which is the same as selling a $55 CSP and a $45 CSP. Selling both of these bumps up monthly profits but only because you are increasing your exposure by taking more positions. It’s somewhat like asking, if I bought 200 IIVI instead of 100 IIVI, could I make more money? Trading Experiences through 11/17/17 Expiration Friday. 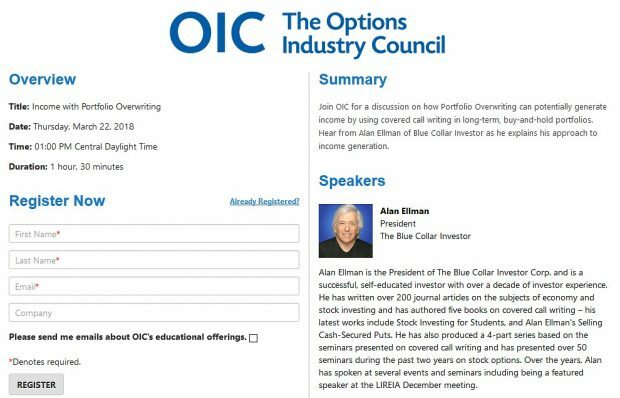 * I have been trading with Alan’s methodology since May of 2016 after spending 4 months reading many books, including the BCI Classic Encyclopedia, on options to get some understanding of them. You don’t really start understanding all the nuances, scenarios, calculations, and actions to take until you do the actual trading. Starting out in an earnings period also did not help for me. * Attached is my YTD performance chart for my combined 4 accounts portfolio at Fidelity and Etrade (Qualified IRA / Unqualified accounts). The first column is the Expiration Friday date. For November 17, notice in columns E and F performance was YTD 23.97%, 26.04% annualized. Performance for the month of November alone was 2.87% (Column G). * Notice from Column G that performance per month over the past varied from -0.7% (a loss-April) to 5.58% (Sept.). * The last column (H) lists, by month, all the securities I traded in the 4 Accounts portfolio and a 5th Joint Trust account where I trade very conservatively with ETFs (generally) for a portion of our joint funds. So I have 8 securities (stock symbols) in the 4 Accounts portfolio and another 4 in the Joint trust account for November. * I diversity each account with 5 different securities per account generally and generally make the same trade in each account in parallel (saves me a lot of time). Have not been laddering strikes in current trade environment. One of the accounts is larger with 7-8 securities. Total is about 27 covered call orders per month. I summed my number of contracts (100 share options) for November and it and came about to 81 over the 5 accounts. Trades on Expiration Friday: I generally start my Expiration Friday trades at a time where I allow at least 1/2 hour per security to be traded. You need time for calculations (ITM, OTM Rolls), order placement (in parallel if same trade) in 5 accounts, playing the spread etc. I monitor the time value and pick those with less time value earlier in the day. For each security and order, I keep track of the current BEP (changes with each trade) , and Cost Basis for ROO% (constant for the entire life cycle of the trade). With that i can calculate gain comparisons for rolls and also the net gain or profit for the entire position. I myself do this manually, but you can use the BCI calculators as well, whatever works best for you. Below is a summary last Friday’s 11/16 trades and comments. The gains below are just for the rolls. Net gain for the total position history is only shown for LIT. * TER Roll out Up 42 to 44 OTM for 1.8% gain, Max. gain 2.51% with upside. * TER Strike 44 exp. worthless. STO on Monday at Strike 44. * SMH RollOut Up 101.5 to 104 OTM 1.73% gain. Gain 2.3% with upside. * DAN rollout out up 30 to 31 ITM for 2.0% Gain. * SOXX Rolled Out 177 to 177 ITM for 2.0% gain. * WGO Rolled Out Up 47 to 49, 49 to 49, 48 to 49, ITM 4.25, 4.1, 4.5% gain. * MKSI exp. Worthless. Will unwind at good opportunity on Monday or later. * LIT exp. Worthless Strike 40 LPrice 39.63. STO next week. Net gain now 5.8%. * EWZ (Stock only – no option. Climbing back up. At last price of 39.83 5.7% loss. Nice performance! Thanks for sharing the details. NIce going Mario! What positions do you have in the December contract as a matter of interest? For my list of December contracts, see the blog I just posted as a new thread 11/24 3:55pm. Here is a copy. I also list in the same log a list of 24 parameters I keep track of for each trade. Picked up TTWO covered call today. Something must be right this month. Found myself diversified in 5 or more stocks and in 6 industries. I list below the IBD Sector Description that the BCI Premium list uses as reference, followed by the sector description (in parenthesis) reported at FINVIZ.COM. I then indicate whether I am ITM or OTM in the contract as initially sold for the current cycle. Thanks for that, always interesting to see what others are investing in! I put TTWO into my option chain calculator (handy tool, just copy and paste to quickly view a whole chain) and see the highest ROO is about 2.3%. I don’t know what ROO you got earlier – possibly higher – but are you satisfied with ROO’s in that range at this stage of the option contract? Attached is the performance chart for our Joint Trust Account which is supposed to be a Conservative ETF or equivalent portfolio to protect the joint funds.. Unfortunately, early on, I violated my trading plan and used some stocks which turned sour and did not do well. Currently the YTD gain is 5.1% or or 8.9% annualized. This still beats a 1.25% CD any time. The current trades in the account are listed in Column H. All securities are covered calls except for EWZ which is a stock only long position. Currently has a loss 4% and I am holding it as it seems EWZ is in a recovering rising price trend. On page 399 of the Complete Encyclopedia for Covered Calls you write that “to capture the dividend, you must purchase the stock before the ex-dividend date” and you have written frequently that if early exercise does happen, it will usually be the day before the ex date. What are the factors we should look for to determine if the option buyer will exercise early if we don’t want to sell our shares? If interested, read last week’s blog. Roni asked the same question and there were a few replies addressing it. I am going through your Covered Call videos on YouTube and they are absolutely great. When you see more “likes” they are from me :). I am learning so much! I first heard about CCs in Robert Kiyosaki workshop (about a week ago). After the workshop, I was looking for more information, but I could not find the person who spoke in the workshop on the Internet. I bumped into you :)! And you have been a great teacher. Thank you! They have these workshops in different cities, they are free, but the next step up is to pay $500 for a 3 day class(all about stocks). You may want to hook up with them, if you are interested in teaching, you are very good at it. :) Anyway, I wonder if you could answer 1 question for me. I am in a stock that is skyrocketing (BABA). Since the market can drop any day, what is the BEST strategy to let the stock run, but protect profits when it drops. What strategy should I learn? All I know and can think of is In the money Covered Call (thank you!) and a regular stop. I want to learn something more suitable quickly (if there is any strategy that is better than a CC and a regular stop) Please let me know. Thanks for your generous remarks. In-the-money covered calls will definitely provide downside protection but will prevent further upside appreciation and increase the chances for share assignment (sale). You may want to purchase a protective put to protect the downside. This can be used in conjunction with covered call writing, a strategy known as the “collar strategy” This will mitigate the cost of the put and also allow for additional share appreciation. I’m interested in advancing my use of options in investing for growth and capital appreciation. I’m not a dividend investor and don’t like letting a stock sink just to keep a dividend. I am a huge fan of IBD and WON. So using an IBD top 10 or 50 as the watchlist is something I already do. I can see getting decent returns on selling covered calls but if the common drops 3-5% you’ve lost money. So owning the common seems risky especially in comparison to a deep in the money high delta (~0.8) long dated (4-6 month) calls. In the latter case I might sell the DITM call based on a technical reason (e.g. Falling below the 200 day) and also buy back the sold call. in short, I’m less interested in buying 5-15,000$ worth of a stock than the deep in the money call. But I am looking for education in option strategies. If you educated about calls as stock replacement and potentially using a (short dated and cheaper) protective put, I think I’d be completely down with your method. I apologize if I’m too unclear, but what do you think? There is no one single strategy appropriate for every investor. Personal risk tolerance, strategy goals and trading styles are just 3 of the factors that go into strategy selection decisions. The fact that you are seeking the education before making a choice is the absolute perfect way to get started. Every strategy has its pros and cons. You are considering using long-term deep-in-the-money calls as stock surrogates. You are considering protective puts. Both strategies are worthy of your consideration. Take your time as you go through the education process and then paper-trade (practice) for a couple on months before risking even one penny of your hard-earned money. Success is right around the corner. Chasing dividend capture doesn’t make a lot of sense since dividends provide yield not return. What does make sense is investing in dividend paying stocks that are “profitable and growing”. Buying a DITM high delta long term calls is aka a Stock Replacement Strategy. It has lower risk with almost the same profit potential as long as it’s a low to moderate IV stock. Do not succumb to leveraging them because they are less expensive. Selling a DITM call along with buying a long put while owning the underlying is not likely to do more than tie up your capital with little potential for gain. You’d have to provide more specifics to thresh that out better. If you are concerned the imbalanced R/R of a covered call and you wish to limit the risk, read Alan’s link that explains collaring long stock. Be aware that collared long stock is equivalent to a vertical spread so if you don’t already own the stock, save on frictional costs (B/A spreads and commissions) by using verticals instead. I then indicate whether I am ITM or OTM in the contract as initially sold for this cycle. For those interested, after 20 months with BCI, I have worked out a list of 24 parameters I keep for each contract position to give me a quick overview of my investments. Useful for daily monitoring, keeping track of closed position, keeping track or rolled positions, exit strategy management (20/10%, Gap up, Gap down, Unwind), End of cycle action items, and calculations of Gain. I also mark any value in Parenthesis if it is the result of a Rolling action. Yes, there are many viewpoints to this business floating around. We all come from diverse histories and experiences. And our future actions reflect that history and experiences. As long as you end up happy in your medium, that’s all it takes to be just fine. One of Alan’s axioms is “protect your hard earned money” when you consider trading with that hard earned money. Protecting those hard earned trading gains can be just as important. But protecting that low end comes at the expense of future continuing rewards. Interesting to consider a Portfolio value that is 100% invested, gains X% in a year and then drops off Y% because of a sudden market downturn. What is left?